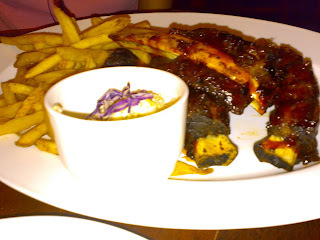 Well, that nite after i fetch my boy from the bus station, we went to Old Town at Dataran for dinner/supper. Thomas ko join us also, and he told us that he already download Kung Fu Dunk and also CJ7. Coz my boy haven watch so after that i went home to take my pendrive and went back to his place so that i could save the shows. 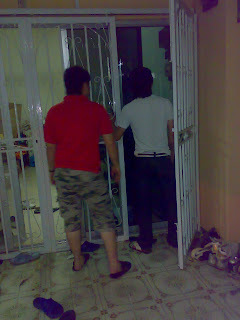 The 2 crazy guys trying to find their way to open the door, without the key. 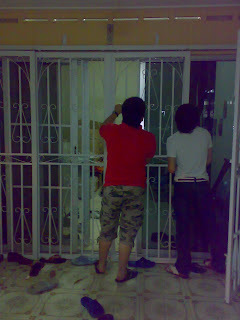 they wanted to unscrew the door! But anwy, they didn't manage to open the door. HAHA! 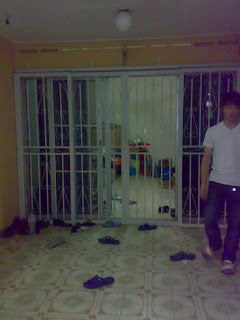 Thomas ko's hsmate came back to open the door for him. So they must fix the door back....silly guys! Tmr i will be going down to JB! Yippie! If not because of my exams, i won't consider so much also. But i already died in one paper, so i don't want to die again! My exams is on thursday, and before this i ady studied a bit. So i guess i still can manage de...hope won die again! And also hope i can get my camera back tmr la. hehe! But anwy, anytg you see there, i will not post it here. Because that's the dream world, here's the real world. Enjoy! 1stly, i think i made someone misunderstood me on my previous post. Anwy, just to make things straight i was talking about Maxis job promoting in Batu Pahat with Pei Xian. 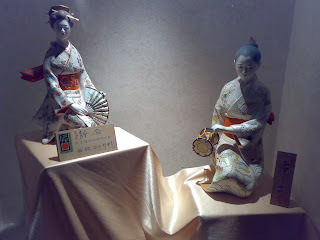 I have already made a public post of apology last year for humiliating that person n hope everything could be better. I even wrote that i won mention it anymore to anyone and sincerely apolize because i don't want to be enemies with that person. I guess that person didn't accept my apology. or mayb she didn't even read it. But truthfully, i admire your courage and independent because i'm not like that. So i wish you all the best again like in wat i wrote in that apology post. Yeah. i know my title sounds weird. How can someone be busy and relaxing at the same time? Well, it seems now that there are too many assignments to be completed and 2 more exams coming up which i haven't even start to read. So you say, am i BUSY but RELAXING? I suppose to be very stress up for all this like how i was during previous semesters. But this semester, i couldn't find any mood to study. Maybe it's because i will be going for Industrial Training next semester. I couldn't find anything to do at home, but i will not touch my books. Even how i told myself that i need to study, i just fought wit myself. I didn't want to study. I want to play my computer, go shopping, karaoke, clubbing, anything other than studying. But still, i'm a good girl. 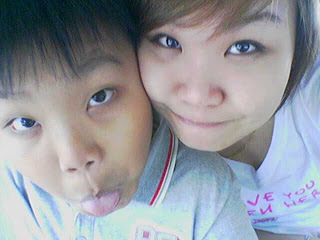 The most i only went for Yumcha and mostly only with Thomas coz we are both the boring ones with nothing to do. Others that i have listed above, i don't even have the chance for those. As i told you, i'm the only one who is BUSY but RELAXING. So, speaking of internship. I'm kind of Excited and feeling SCARED. Well, being a 22 year old girl, i have never work before. YES! I HAVE NEVER WORK BEFORE! During secondary school times, every holiday my friends will be out working and earning their money. And everytime when they talk about work, what they did during holiday, i could only stare, listen and couldn't even say anything. that sounds pathetic. I wanted to work. But since young, my parents are very protective of me. I'm like those animals that are protected like turtles. I never took a public transport myself. I don't even dare to take the LRT but now i've improve a bit. With my parents so protective of me, i tend to be someone who would rely on people, or to say not so independent. My parents send and fetch me to school everyday. And going out with friends is a NONO. Every holiday i will be at home, eating, watching tv, sleeping. I asked my mum to let me go and work during the holidays, she didn't allow. The most, i will help out at my dad's company, and the workers there alwiz calls me ANAK BOSS. Sounds like a rich girl, but then now i think being the ANAK BOSS also not that good. 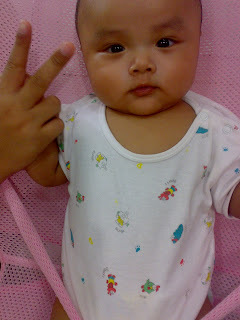 Go out and work who wanna call me ANAK BOSS??? So after i've came to study in Melaka, finally i'm out from that protected world, into a free world. I need to learn to take care of myself and i started going out with friends. During Junior time i still alwiz call my mum and tell her of my problems and how to solve them. But slowly i growed and know things sometimes must be solve on my own, and i shouldn't alwiz ask my mum. And it really feels nice when i started to solve my own problems. There's one time, i thought of working and my friend asked me to join her to promote something. I was happy to think that i could earn my own money. And so i accepted, but then after that i rejected again. 1st i was scared, i have never work before and was really scared. but i know everything needs to have a start. 2nd reason for rejecting, i have some time clashed wit my classes. And the 3rd reason and also the main reason, that stupid supervisor said something that i really didn't like to hear. She ask me whether i have work before and surely i said no. 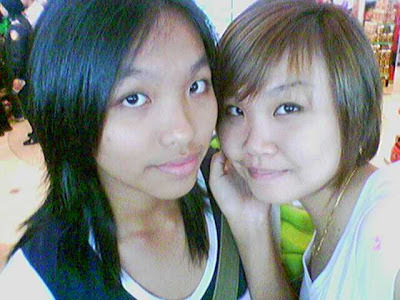 And than she look at the others and said very loudly " This one leh! is called NO EXPERIENCE LA!" I don't know why she must say it in that way, but it reli hurts me. I thought of not going to class to go for the job, but in the end, i told my friend that i don't wanna go anymore, i wanna go for my class. Yes i have no experience. Yes i'm a very protected girl. And no, i do not like it this way! i HATED that person to talk to me in that way. NO ONE OTHER THAN MY PARENTS COULD TALK TO ME THAT WAY! Ok, i know i sound like a rich brat, but i'm not. I'm just too protected that i could not accept people talking to me this way. After that incident, whoever offer me jobs, i tend to reject. I don't want to hear people saying those things to me again. But hey, i know i'm wrong of thinking like this. Coz everything has a start. 1st people will say you have no experience, the 2nd time, i might be the one saying others have no experience. But still, i tend to reject. The interview for my internship went smoothly. No words like no experience came out from the interviewer's mouth. And they were very nice. So, i will keep my 1st time for my internship. I'm really excited on what i would learn, who i would meet. And its another big step for me, for being more independent. My dad ask me a question the other day....which makes me kind of sien diao. but it's funny. So i was hoping readers of my blog could guess this. So now, the questions is - what is OSIM? Before coming back, dad took the whole family for lunch. 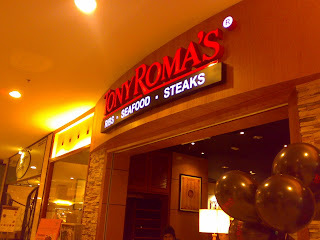 We went to Gardens beside Midvalley to eat at Tony Roma's. 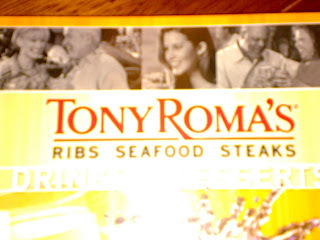 Tony Roma's is about similar to TGI Friday's but dad says that it is better. 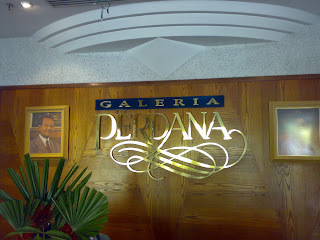 The service here were great as the waiter who serve us was very friendly. "Hi, i will be serving you today. Is this your 1st time here Sir? Do you need me to give you a brief introduction or recommendation on the food here?" And he start introducing each category's of food. Starters, Main course, soup, dessert. 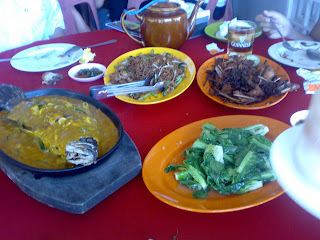 We ordered 4 plates of main course for sharing because the meals are all very big. 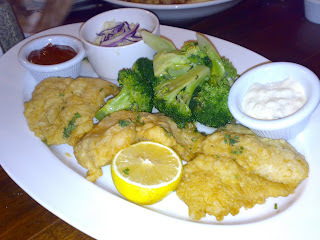 The pasta, Fish and chips, Chicken Chop, and their famous Beef Rips. 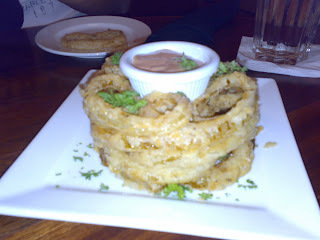 They also gave us free starters which is Onion Rings and also Garlic Bread. Before the food came, the waiter came with a basket, and inside was 4 different kind of sauce for the beef rip. He explain each one, telling us which is more popular and also wat kind of taste they are. So after that, the food came. Super loads to eat. The very nice Chicken chop. I forgotten the name..but it's delicious! Eating halfway, the manager came to pay a visit at our table. "So how's the meal? [good good] Everything ok? [Yup..everything very nice] So is this your 1st time here? [No actually we been here before.] I hope you're enjoying yourself here. [Yes..my children are enjoying it.] So you staying nearby? [Yes..quite near] Oh..good. Then i could see you quite often coming here for a meal. [Silent laughter] Don't worry! We will give you a discount. Haha! Ok..hope you enjoy yourself. If you need anytg just inform the waiter. [Ok..thanks thanks!]" 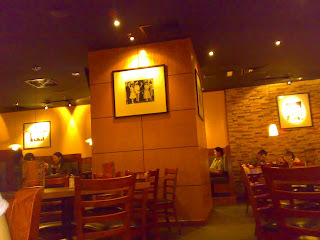 Well, the bill came out to about RM200, but everything was very nice, so i guess it's worth it. 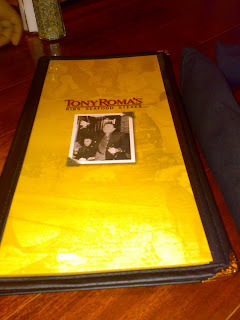 Will visit Tony Roma's again! 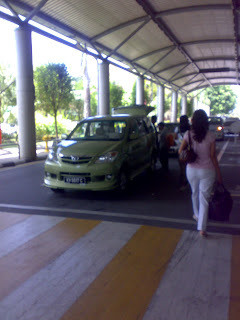 That day before my langkawi trip, when i got back home from melaka, my mum gave me a GIGANTIC exagerating exagerating..haha! big box inside a huge plastic bag. I know you cant see how big is it...but seriously, it was big. 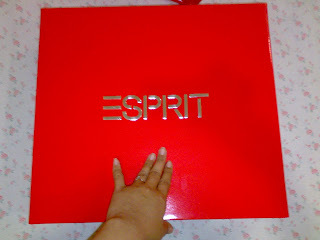 Written esprit outside, so i was excited to see the thing inside. YES! 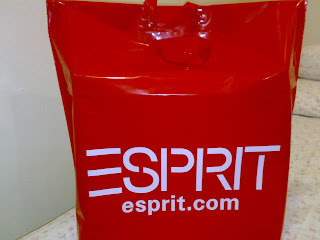 It's the bag i wanted from Esprit! 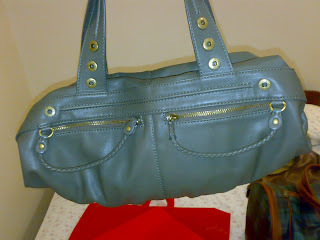 I didn't have much cash wit me at Melaka so i MMS my mum the picture to ask whether i could buy it. So now, i got it ady! Happy Happy! 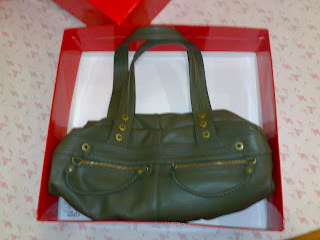 My new bag!! It was super hot there because it is an island. The hot temperature is from the sea... The Mat Salleh there really love walking in the hot sun which we find it so crazy!! All of them red..some even burned! But anyway, enough of crap. I came back from Melaka on Saturday at 7am because i need to rush back to go to LCCT at 10.30am for the flight at 12.50pm. Us at the airport. Dad's holding the camera. 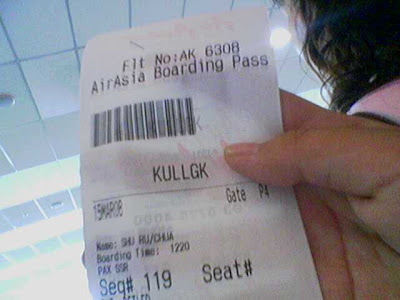 Our flight was delayed, but then, we reach Langkawi around 30 minutes. Or did i mistaken the time? We rented a car there. Toyota Avanza for RM180. 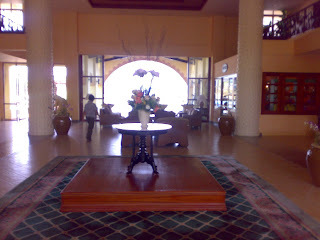 And checked in to the AWANA PORTA MALAI hotel. 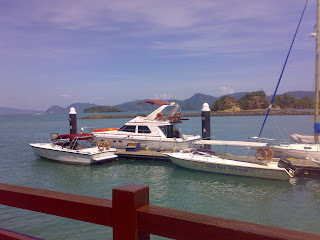 The hotel is at the tip of the island which is also a jetty. We also saw a cruise stopping there. View outside Awana..nice blue sea! 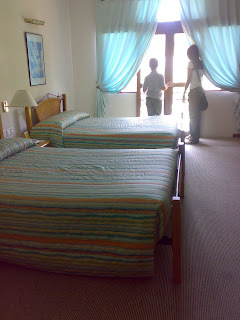 The room was not bad, with 2 big double bed. Facing the pool. Mum don't want to get a room facing the sea because she scared of Tsunami! haha! outside view from our room..
We were so super hungry so after putting everything in the room, we went out to find for food. Food is very expensive there, mayb due to lots of foreigners there and also because the business are not very good there anymore, so they increase the price. 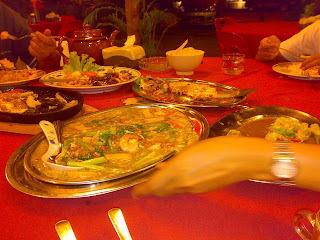 We ate at one nearby restaurant and the meal cost about Rm112. just 4 dishes, 1 pot of tea, and 3 coconut. 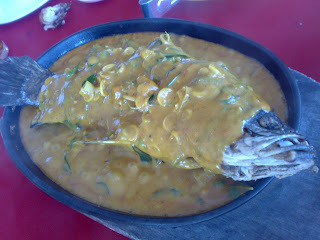 my brother like this fish a lot...Curry fish. After that, we went to a small shopping place beside the Underwater world. We didn't enter the Underwater world because we heard that the KLCC's one is better. Kuah Town is super hot!!! The sun is burning! And i really cannot stand the heat! I went in every shop to see the price for liqour, and finally found one place cheaper than the Underwater world. the small bottle of Vodka cost RM6.20 at the water world but then then shop at Kuah town only selling at RM6. I forgotten the price of the Bacardi but i got it wit RM39 at Kuah town. Mum bought 11 bars of chocolate! yum yum! After shopping, we went to the Eagle square. a place where you can see the eagles flying here and there. 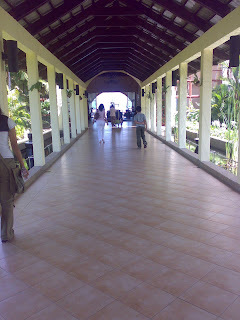 hehe....We took loads of photos there with the big eagle statue and also manage to see 3 - 4 eagles in the sky. 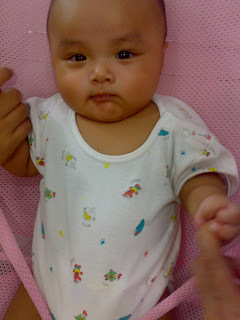 Due to the hot sun, mum got sick and had migrain. So, we went back to the hotel for dinner at the restaurant downstairs. 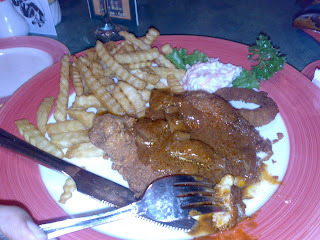 I ordered a chicken chop which cost RM25. damn..so expensive. My brother said his Spaghetti was delicious. Sure la.RM20 leh! My dad's cantonese fried kuey teow was very presentable but then the kuey teow inside wasn't as much as the price. RM18!! 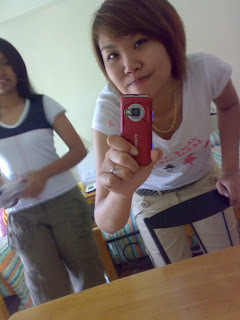 The next day, our plans were delayed because mum wasn't feeling well. 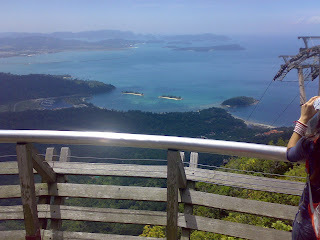 Dad went to find medicine for her and after that about 11am only we went out for our Langkawi tour. 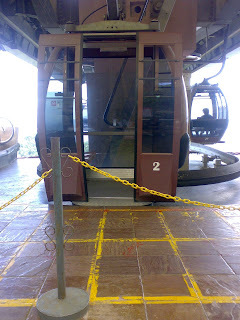 We went to the Cable car. The view there was so nice! 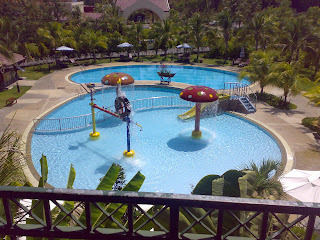 I really love it there!! The is a Sky bridge there which connects one mountain to the other. Super nice! 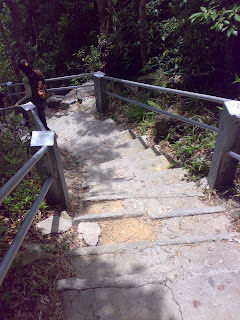 But scary..coz it was too high. My sister and I didn't even finish walking the bridge because we were too scared. The beautiful but SCARY bridge..it's just hanging..like a canopy. 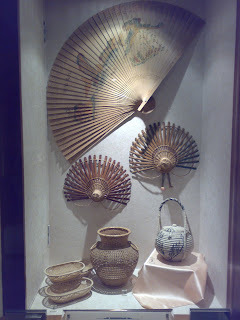 After the cable car, we went back to the hotel because my mum was feeling very sick. We bought KFC and ate at the hotel. After that, i slept! haha..but my family went out. So i was alone in the hotel. When they came back, my brother and my dad went for a swim at the pool, so my sis, my mum and i went to sit at those benches to look at the sea. Comfortable..so relaxing! We went out for dinner. 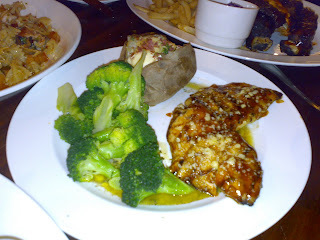 This time our meal was more satisfying because the price was not unreasonable like the 1st restaurant we went. 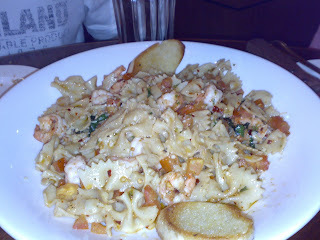 The food was also not bad. We also tried their Chicken chop which was delicious! The next day after our buffet breakfast, we wanted to visit one more important place before leaving Langkawi. 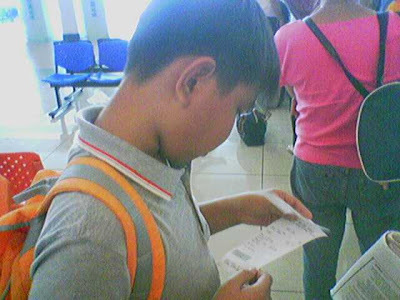 Our flight is 2.15pm so we need to reach the airport around 1pm. 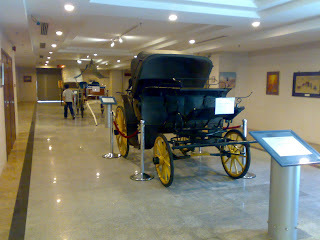 About 11am we drove to Galeri Perdana which is a museum that they put all the gifts that Mahatir had recieved. My dad say he must go to this place because he wanna see how many cars Mahatir have. 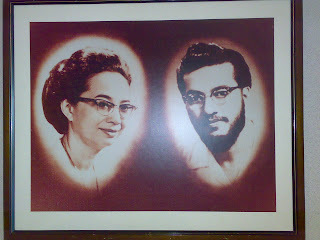 Carriage..a gift to Mahatir too..
Picture of Mahatir and Siti Hasmah when they were very young.. I like this picture. The words beside it are "Tree. 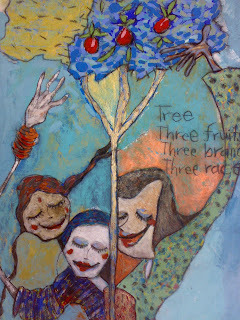 Three fruits. Three Branches. Three races." There are lots more things there. But i don't have the time to upload so many pictures. He is really a great man. If he is not a great man, there won't be so many gifts to him. Really A LOT! 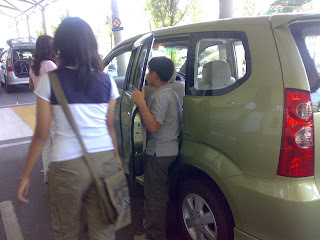 There are a few cars gifted to him too..but i didn't take the pictures of it coz i was already too lazy. hehe. It was a wonderful trip even though mum was sick for one day. 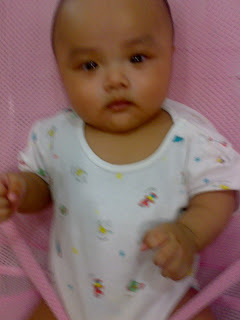 I'm still happy to go for holiday with my family. 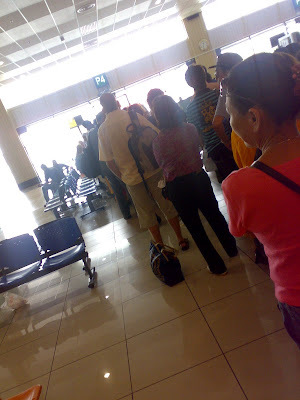 And this is the first time going on the plane with the whole family. 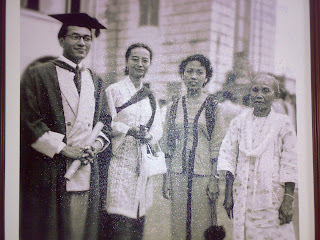 I alwiz go overseas alone wit my auntie and my dad alwiz goes alone to overseas for exhibition. So i'm really happy that this time, we went on a trip together - by air!